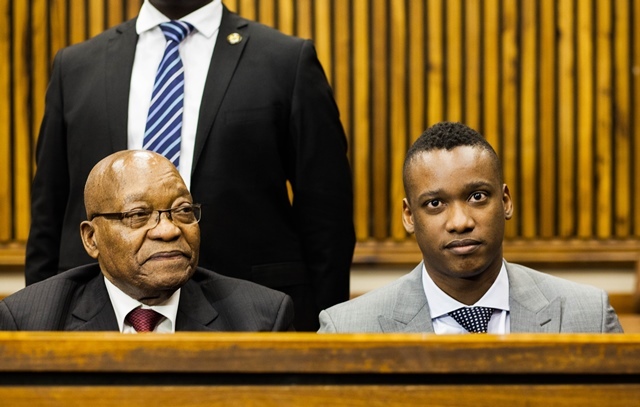 Duduzane Zuma sits next to his father, former president Jacob Zuma, at the Randburg Magistrate's Court in Johannesburg, 23 August 2018. A report suggests that if you want the US government to get interested in you, then get into uranium mining. The paper reports that South African intelligence followed up on early warnings from the CIA about the “Gupta threat” to “national security” in 2009, and the then heads of intelligence in the country “tried to caution then president Jacob Zuma that his relationship with the Guptas was undermining national security”. The paper suggests that state security minister at the time, Siyabonga Cwele, forced former spy bosses Gibson Njenje (the former head of the now renamed National Intelligence Agency), Moe Shaik and Mzuvukile Jeff Maqetuka out of the public service because their probing of the Guptas was supposedly irregular. They had allegedly found “alarming evidence” that the Guptas played a big role in Zuma’s Cabinet reshuffle of October 2010. Former communications minister Siphiwe Nyanda told the Sunday Times he was fired because he would not give in to demands to allow Guptas access to the communications sector, particularly with regards to influence over the SABC. After he was removed, Gupta ally Roy Padayachie took over for about a year and signed a hugely favourable sponsorship deal for the Guptas’ notorious New Age breakfasts. A number of other ministers were removed in that reshuffle and replaced with those allegedly more in line with Gupta interests. The state capture commission of inquiry has heard allegations that, for example, former public enterprises minister Barbara Hogan was removed and replaced with Malusi Gigaba to allow the family’s attempt to gain control of a passenger flight route to India to go through. Nyanda was reported as saying that “we were the first victims of these series of Gupta purges”. He also told the paper that Zuma’s son Duduzane and the Gupta brothers had come to see him when he was still communications minister, ostensibly to “introduce themselves”, which he did not find particularly remarkable at the time. Zuma reshuffled his cabinet 11 times over his nearly two terms, with many alleging that Gupta influence was becoming increasingly brazen every time it happened.